Pallets are considered quite valueless object and in fact they are so inexpensive that you can find them for free. But when they pass through pallet art they convert into valuable decor item which can enhance the effect of atmosphere. There are some options that can raise these valueless pallets to the most valuable objects. 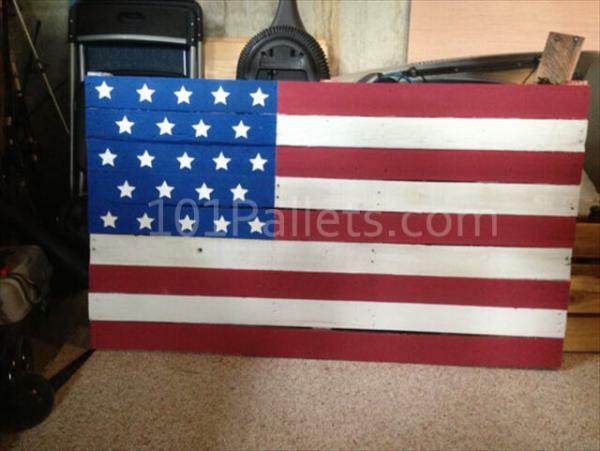 Pallet American flag is one of such options as national flags are the most precious item. 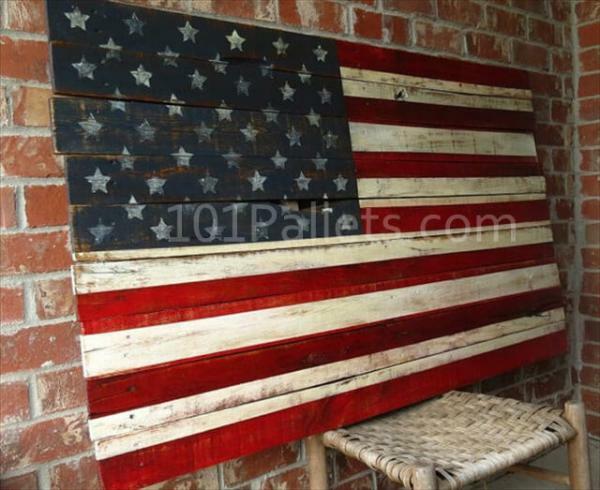 Pallet art helps you to create this valuable object when you are in a non-suitable situation where you can’t have American flag but you need it. DIY pallet American flag can be made using minimum resources without any trouble. This reflects your love for your nation that you have created your national flag in a unique method. For creating a pallet American flag you need to have pallets, nails, glue, paint, brush and some basic tools. You may select reclaimed wood for making wooden pallet American flag that will also promote eco friendly behavior of American nation. Varnish coat supplies excellent protective layer to your marvelous production. Collect the required materials and in first step make the pallet surface smooth using sand paper. Now arrange the wooden pallets side by side to create a platform on which you will draw American flag. 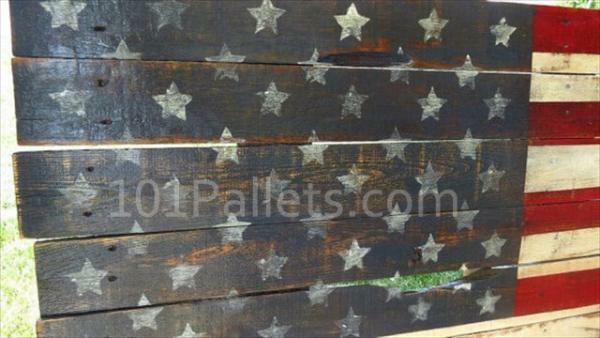 Use glue and nails for the durability of wooden pallet American flag. Apply white pain as base coat and let it dry. Now draw flag pattern on this platform and paint it with respective paint colors. 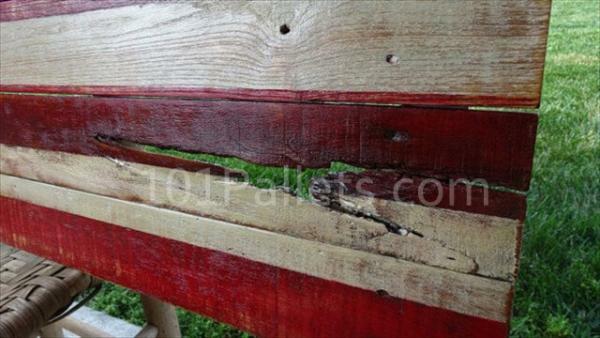 Apply varnish coat as protective top layer to the pallet flag as it will resist against weathering. 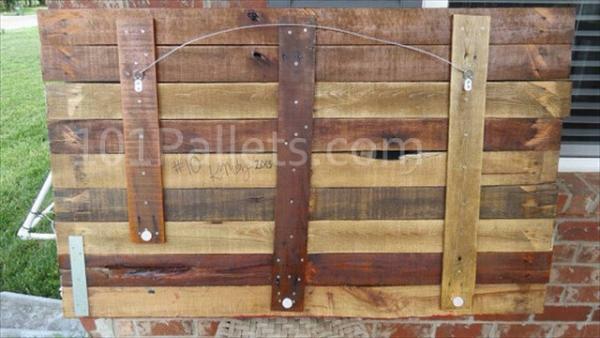 At the end fix clips or hooks at the back for placing the diy pallet American flag. You may add wooden pallet stand to hold the flag.